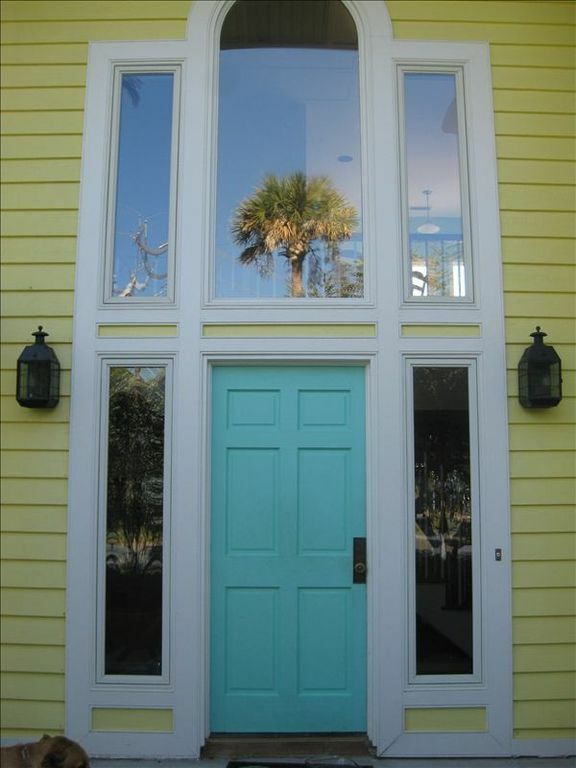 Inviting 4 BR Isle of Palms house. Great location - walk to the beach! Bright and spacious beach home just 900 feet from the beach (only a block away)! Our house is comfortable and feels more like a home than a beach rental. It is very family friendly, but is also great for a group getaway. It has been used it for college weekends, wedding groups, reunions, girls getaways, etc.. The house is located on a quiet street with parking for four cars. The area has a great sense of community. The spacious, clean and inviting beach is less than a five minute walk from the house. The beach has a very long gradual slope to deeper water, which is ideal for little ones. This house boasts an open floor plan upstairs. Downstairs, there are four bedrooms, three baths, a den with a sleeper sofa. Three of the bedrooms have queen sized beds, and the fourth room has two bunk beds, one with a single bed on top and a double bed on the bottom and another bunk bed with two single beds. The kitchen is stocked with the basics - microwave, coffee pot, dishwasher, toaster, blender, waffle iron, etc. We have three levels of outdoor space for enjoying the ocean breezes, with a screened in porch as well as second and third level decks. Enjoy free wifi and 4 tvs. You can grill and eat outdoors on the patio, or inside at the spacious dining room table. You will love relaxing with a drink and listening to the ocean or just soaking in the beach life. You can rock in the rockers on the main deck while ocean breezes keep you cool. Take a walk on the beach at sunrise or sunset and enjoy the natural beauty and friendly people. This is a great house for a single family with kids or an extended family to enjoy all that the Isle of Palms, Mount Pleasant and Charleston have to offer. Things to Do: The whole island is bike friendly, and you can bike down to the pier, or the town center and park, which is less than a mile away. The town has nice high end restaurants, pizza parlors, casual restaurants, ice cream shops, a cantina, sports bar, and gift and specialty shops. There is also live music most nights in the summer at a rooftop bar and grill. There is a liquor store and a fish store less than two miles from the house, and places to rent surfboards or schedule water activities. There is a great recreation center with an outdoor playground, yoga classes, basketball, and lots of other activities. If you want to leave the island, you can head down to Sullivan's Island and explore Fort Moultrie, or go kayaking and watch the dolphins. Make sure to get into Charleston to see the beautiful homes, and eat at the great restaurants. Go to Battery Park, Patriot's Point and Fort Sumpter, the museums, take a tour or just people watch. The Saturday morning Farmer's Market is always great, and there are wonderful fish markets all around. Charleston is our dream location with lots of culture, history, food, and recreational activities. The town has something for everyone whether it is a sporting event, concert, art, or simply a relaxing walk on the beach. We want you to enjoy your stay as much as we do. We both fell in love with Isle of Palms and the surrounding area while working here. Our dream is to live here permanently one day and spend as much time here as possible in the meantime. We love sharing our home with other beach lovers so they can also enjoy the laid back, peaceful beach atmosphere that IOP has to offer. We love this home, the beach, the community and the local area. We hope others enjoy their stay in this cheery yellow home as much as we do. This property has a fantastic location, and it is a great, well-kept vacation house. It is less than a five minute walk from the beach, near a playground and recreation center. It is close to the airport, Charleston, and Mount Pleasant. It is a beautiful community with lots of friendly people and many great activities. The beach is lovely, clean and wide. Everything is close by and you can bike everywhere. We have great restaurants in downtown IOP, an excellent fresh fish store, Ben and Jerry's, and other little shops. This house is ideal for a relaxing vacation. Lots of outdoor space - three decks, fenced in back yard, easy walk to the beach, homey and just the way a beach house should be. Away from the hustle and bustle, but close enough to be in the middle of the action in a matter of minutes. Hear the ocean while sitting on any of the outdoor decks. Currently enjoying partial ocean views from the upper deck! Very short walk to Isle of Palms beach. 1000 feet from the Atlantic Ocean. Can see a small portion of the ocean from crow's nest deck. The ocean can be heard at night from that deck. Two AC units - one for each floor. Nest System for ease and comfort. Two units - one for each floor. Nest System for ease and comfort. High thread count sheets in bedrooms and den. Bath towel, hand towel, and washcloth for each renter. Check the closets for beach towels. We try to leave a few in case you forgot yours. Table is extendable to comfortably seat 8-10. Flat screen TVs in den, living room, and all bedrooms except the bunk room. A variety of books upstairs in living area for your reading pleasure. There are a few games and puzzles for your relaxing enjoyment. There are a few beach toys left on the screened in back porch for your family's enjoyment. Make sure you check out the crow's nest upstairs. It is a favorite place to relax and enjoy the beach atmosphere. We did enjoy our stay, but we felt a little misled by the photos of the house compared to the actual amenities. Beginning with the curb appeal, the men in our family all agreed the dead tree in the front yard needs to be removed. The exterior of the house needs some fresh touch ups. The master suite and bath were clean and lovely. The other bedrooms and baths could have used a good cleaning, starting with a new shower curtain or removing the mold on the existing one in the Jack & Jill bath. Likewise, with the kitchen; we all felt we had to do some cleaning before we were comfortable cooking in there. It would have been nice to have some instructions for using the stove & oven, and we had difficulty getting the dishwasher to work so we washed most dishes by hand. We are a very casual family, but the dishes, glasses and utensils felt a little like garage-sale finds. I think we all agreed the home would have felt more vacation-like & luxurious if it was cleaner and we weren’t using “odds & ends” in the kitchen. A new set of pots and pans would be a great addition. On a positive note, Misty was easy to work with and attentive to any questions. The house is only 2 blocks from the beach so it was a quick, easy walk, and our grandchildren enjoyed every minute in the water. Our best suggestion would be to find a new cleaning company and restock the kitchen ware. One other thought we had was that it would be nice to have a path from the outdoor shower to the house. After rinsing sand off our feet, we had to track through the grass & dirt to go inside so it was kind of useless. We used the hose at the front of the house instead. A great house for a family reunion of all ages and sooo close to the beach! We came from the midwest and the south (three families). This house took good care of us all. The a/c worked great in the 4th of July heat. The living room was just right for us to cheer for our favorite World Cup team. The dining room table was ample for all 11 of us to gather together. The beach is just a block away and the beach cart helped transport the toys and chairs. There are great restaurants close by and supermarkets to buy from so we could do some of our own meals in the well stocked kitchen. Oh, we'd love to do it again soon! Great home for a big family. Plenty of room to spread out!! We are so glad your family enjoyed staying at the house! We hope to see you again on future visits to IOP. House was perfect for our visit! Close to beach and restaurants. Thoroughly enjoyed our stay. Thank you! We are so glad you enjoyed your stay! We hope to see you again for future visits to IOP. Location to the beach was great. Easy access. Neighbors very friendly. But the house was not our favorite. Kitchen was tiny (our stay was during Thanksgiving). Hardly enough room for even one cook. Very outdated appliances. Gas oven needs some work. No bathroom on the main floor. Deck overlooked a construction site with lots of loud banging, etc. No temperature controls available to guests in the house (looks like it might be controlled remotely by owners or simply locked out to guests). No extra bath towels provided so we ended up using a couple of the beach towels. Bikes were just outside front door as if left for guests to use, but were locked with no combination made available. Confusing check out instructions left with regards to trash cans (after emailing owner, we received correct instructions, but the owners will get another ticket - an old ticket was left on one garbage can - for leaving cans out too long). Cleaning service between guests could have done a better job (I had to clean kitchen counters and one bathroom before using). The house needs some TLC. Nothing truly bad to report, but since we've been doing this trip we've learned what other owners do to make their guests comfortable. This house just didn't work for us. Great place for my family. Excellent location, 5 minute walk to the beach, clean, with enough bedrooms and space for everyone in my party (6 adults, 2 children, and a toddler). 13 miles to Charleston. 4 miles to Mt. Pleasant. Close to the Charleston airport, historic attractions, museums, outstanding restaurants, great markets, and discount shopping, as well as high end specialty stores. There are two golf courses on the Island, a water park and a trampoline park in Mt. Pleasant, and multiple cineplexes. You can rent bicycles near by, and the windsurfing is great in the spring and fall as well as winter - with a wetsuit. The Harris Teeter on the island is only a 3 miles away for very convenient grocery shopping. IOP has a great recreation center with a playground and basketball courts. Lots of classes are available such as yoga.